The Ashley Maria Blog: When Seasons Change.. I don't say this very often but- I HATE SHOPPING.. when the change of seasonal clothing is taking place. Woof! there done- never saying that again!! But this statement is true!! It's July. It's 95+ degrees. I just went swimming. and you are trying to tell me to try on hot, tight jeans-NO. Today I thought I'd share with you some outfits and pieces you can use to transform your wardrobe from Summer nights to Fall days! I noticed that I have a slight obsession with stripes. Don't judge me for it!! A long sleeve dress is always good for those cooler days or throw on a blazer or denim jacket for a chilly night. 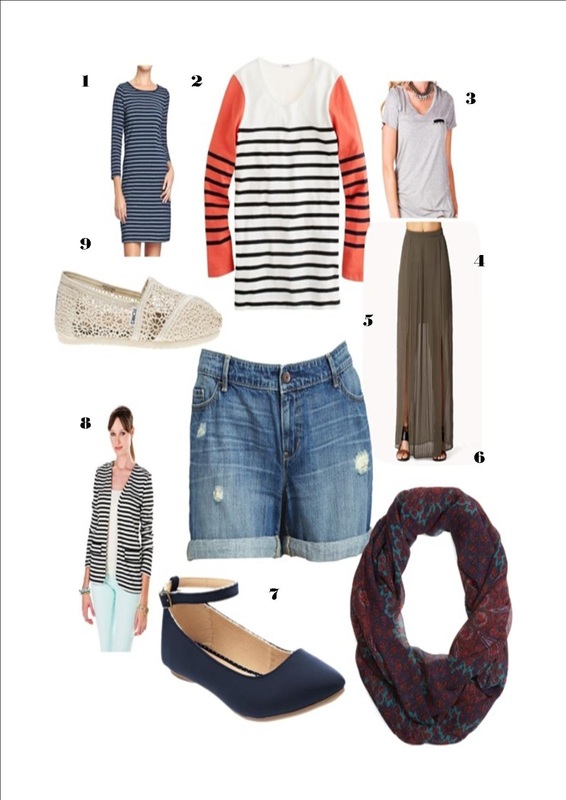 Try out a 1/3 sleeve paired with your summer shorts and sneakers, or dress up a tank and tee with a light weight scarf. Maxi skirts can still be worn in the appropriate colors paired with the right pieces. I am crushing hard on ankle straps too and might just pair them with shorts!! What are some pieces you use to transition the seasons?